While on vacation in Spain a young Wall Street trader's family is kidnapped. With only hours to find them, he must uncover a government conspiracy and its connection to his father's secrets. 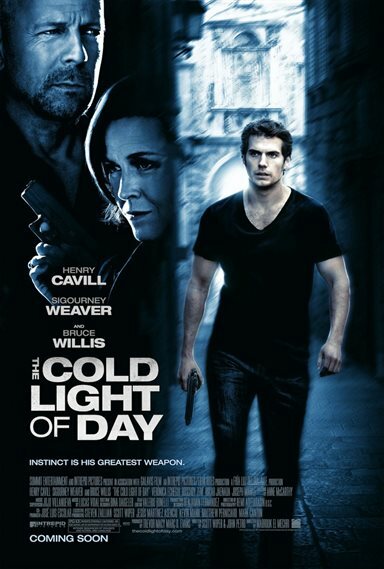 Download The Cold Light of Day in Digital HD from the iTunes store. The Cold Light of Day images are © Summit Entertainment. All Rights Reserved. When recently failed businessman Will Shaw (Henry Cavill) goes to Spain for a weeklong sailing vacation with his family, it appears he thought that nothing else in his world could get any worse. But after returning from a brief trip ashore, Shaw finds it difficult to locate the family yacht; when he does, his already fragile world is shattered as he finds his family is missing. This is the first of a few surprises in store for Shaw -- one being that his father (Bruce Willis) may not be the man he thought he was. Once he realizes that his family has indeed been kidnapped, it is left to father and son to find them. But unexpectedly, his father dies, and Shaw finds himself in a foreign country with no friends and his family solely reliant on him. Then a friendly face, Lucia (Veronica Echegui), helps him out. Once the layers of the onion are peeled away, this film is basically an action thriller, pitting the Israeli Mossad against an elite unit from the CIA, headed by Jean Carrack (Sigourney Weaver), whom Mossad believes is responsible for the selling of secrets for personal gain. And Will and Lucia are stuck in between them. With a cast featuring Willis, Weaver, and especially Cavill as he is to be the next Man of Steel, you walk in to the theatre with preconceptions, one being that this movie is going to be good for the ride; unfortunately, The Cold Light of Day does not deliver the ride you are expecting. Bruce Willis, who is only in the film for the first twenty-five minutes or so, does a good job of holding the opening together -- so much so that you get the feeling this movie is going to springboard to life in to another "Bourne"-like film. Unfortunately, it never does. Sigourney Weaver and Henry Cavill are accomplished enough, but it felt like they were well within their comfort zone -- shame -- as we all know how good Weaver is and what the rising talent Cavill will surely be. If there is one thing that this sort of film is renowned for, it has to be the relentless car chases and the seemingly impossible stunts; again, you feel cheated here. Anyone familiar with Bourne or Mission Impossible has seen it all before. Even the shots of a Mediterranean town looked wholly familiar. This movie could have been a lot better than it actually turned out to be; it lacked direction and quickly turned predictable, and I walked out of the theatre disappointed. Everything has a silver lining, though, and The Cold Light of Day's is the fact it is only 93 minutes long. The Cold Light of Day images © Summit Entertainment. All Rights Reserved.